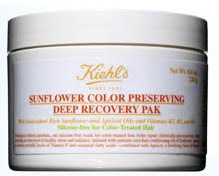 Is there anything better-smelling than Kiehl's Sunflower Color Preserving Deep Recovery Pak? If so, I haven't found it. This hair mask seriously smells so good, I can't stop sniffing my strands! And if that's not enough, it makes your tresses SO. SUPER. SOFT. They've never felt so silky smooth! Kiehl's Sunflower Color Preserving Deep Recovery Pak retails for $25 at kiehls.com.